There's more to a district governor's year than his 12-month reign. During my year as district governor nominee, and even the six months prior to that, I laid the groundwork for the team and the objectives that would shape my year as DG. Anyone who thinks it's merely a 12-month commitment isn't aware of the challenges. There were several key projects that I knew I wanted to accomplish. Perhaps the major one was to publish this history of District 764. Another was to publish a comprehensive monthly governor's newsletter to give as much coverage as possible to all clubs in the district. Group A-B-C-D dinner meetings at which I would inform the member clubs of my projects for the year. And, of course, my club visits. Obviously it takes a great deal of planning and a tremendous amount of cooperation and working together within the district to ensure a successful year. And one secret of my success, as it turns out, was having two key people in place at the beginning of my year as DG. One of them was Bryan Racey, my administrative assistant who also happens to be one of my employees. Bryan not only handled a myriad of responsibilities as my assistant, his work on the newsletter and the history book was extraordinary. To be honest, I don't know that my year would have been as productive without Bryan's tremendous help. 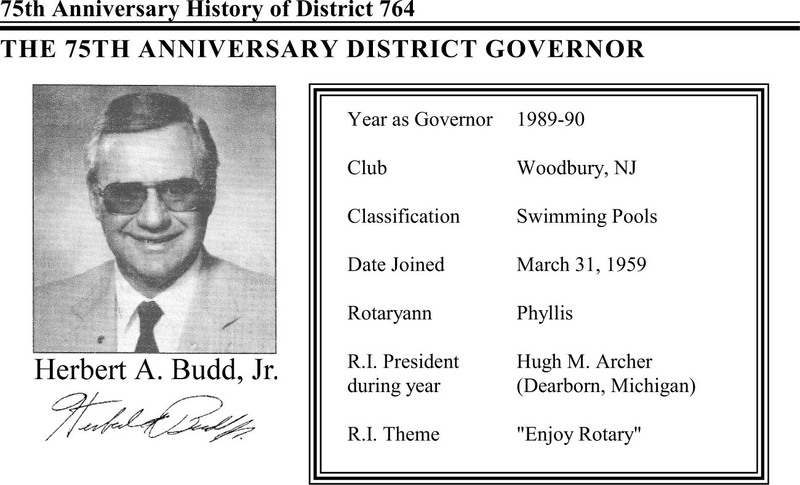 The other was Bob Shryock, a fellow Woodbury Rotarian. I hired Bob to write, edit and design the newsletter, and to compile and write the histories of all of the clubs in the district. When I spoke to Bryan and Bob about the assignment, both were apprehensive about getting the job completed on time, but they did due to their dedication and constant prodding of the district governor They accomplished the impossible, it just took them a little longer than they hoped. Officially my year started with the Changeover Dinner, which my club and its members helped to plan and helped make a success. It was well attended and enjoyed by all, and it served as a launching pad for what has turned out to be a great year not only for me, but for every Rotarian in the district. One of the highlights for me was our district trip to Chicago, a project I wanted to do because of my interest in the history of Rotary. Although our group was small, it was a group that was interested in the events and made the most of the experience. We had a chance to walk where Paul Harris walked and where thousands of Rotarians before us had been. The chance to visit with Hugh Archer, the President of Rotary International, and sit at his desk, gave us the feeling that Rotary is truly an international organization. Also, we had the chance to meet all of the full-time dedicated staff of R.I. who work so hard for Rotary. During my year we had two Group Study Exchange teams, which is a bit unusual and which also was a challenge. But with the help of all Rotarians in the district we were able to accomplish that task. Phyllis Pearl becoming the first woman club president in District 764 history (besides that, we had the first mother-daughter member team in district history and the first club giving a baby shower for one its members. Hearing Carlos Canesco speak at the Rotary Foundation dinner. And, as I write this, I'm looking forward to several wrap up events for my year including our district cruise to Alaska and the R.I. convention in Portland. The need for a mail ballot for the race for district governor nominee 1991-92 was a challenge, and although it put a lot of work on the district governor and his staff it showed that democracy was in action in the district. One of my pet projects was the Rotary Rose note cards that we gave to the ladies at our district conference at Inner Harbor. It's a project that's now being used throughout the Rotary world for fund-raising projects. I'm very pleased that District 764 became the first in R.I. to sell as much as 10 percent of the world's production of Rotary Roses during the past year. I was very pleased to maintain the district connection to the Rotary Tree of Life at Cooper Hospital in Camden, and I know that's a project that's going to be kept alive by Gov. Mike Kittis. My year was perhaps highlighted by an outstanding district conference in Baltimore that was made possible by all Rotarians in the district, and especially by members of my Woodbury Rotary Club who worked so hard to make it a reality. My very special thanks to Art Pilling, who did an extraordinary job as district conference chairman, and Fran North, who did yeoman work in his supporting role as Woodbury president for the year. During the Baltimore conference we enjoyed many outstanding speakers including R.I. vice president-elect Bill Huntley, the President's representative; Past President Jim Bomar; R.I. Director Rick King; and past R.I. Director Ken Erdman. It was due in part to these marvelous speakers, to a great GSE team from India, and to all of the fun-loving Rotarians and their spouses who enjoyed the St. Patty's party that the conference was a major success. It's tough to give thanks when so many helped, but I want to give special kudos to DGN Mike Kittis for his extraordinary help throughout my year; PDGs Bill Lamon and Neil Garber for their help; and DGN 1991-92 Col. Jim Davidson for his support. PDGs Jim Lilley and Lou Joyce were a major help to me with their work on the GSE teams. And Joyce worked hard to help with the formation of the new Woodbury Rotary Breakfast Club, another of my project goals for the year. Additionally, PDG Herb Hecker from my Woodbury club stuck with me during the trials and tribulations of my governship. Thanks to my chaplains, Rev. Ernie Spangler and PDG Rev. Ralph Shockey; to Sam Silverman for handling the mailings of the newsletters; to Tom Mahoney for his work as treasurer and Dave Blyler as secretary; and to PDG Frank Quigley, the Grand Old Man of Rotary in our district, for his efforts on my behalf. I also would like to especially thank my wife Phyllis for her complete dedication and support. Without her acceptance of my long hours away from home I could not have accomplished the many tasks of the job. Also, our son Randy and our daughters Wanda and Donnalee, as well as their spouses, all pitched in to run the family businesses and allowed the resources to be used in the furtherance of Rotary. Perhaps now that my year is complete I'll have more time to spend with my eight grandchildren. I'd like to say I'm very proud that the Budd family has worked so hard together to help make my year as governor as easy as possible. Without their understanding and support, I doubt that my sanity would have survived. There's countless others to thank, too. Suffice it to say a Rotary district governor can't function without the kind of support, from family and fellow Rotarians, I received. Thanks to all of you. 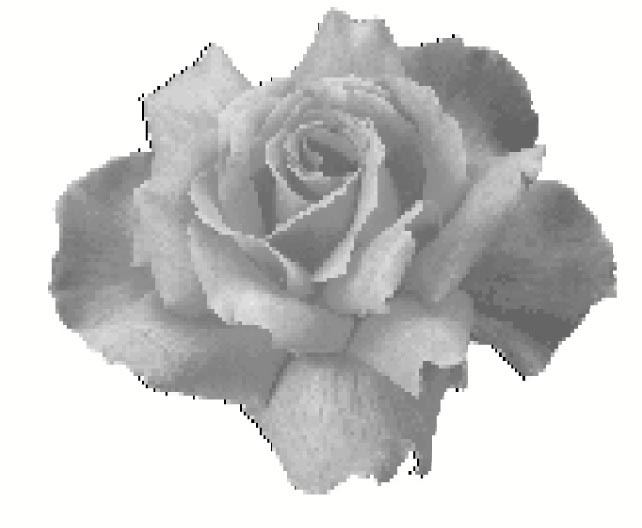 Below is a black and white reproduction of the four color ROTARY ROSE NOTECARD printed by Governor Herbert A. Budd, Jr. 10,000 were printed. They are 10 cards and envelopes in a package. They are available at $5.00 per package of 10. For information contact Governor Budd at the addresses on the contents page of this book (page viii).